The UCF community recognized eight early-career professors who have achieved noteworthy research or creative activities of national impact with Reach for the Stars Awards today. President John C. Hitt selects the winners based on the faculty members’ past four years of work. Recipients must be an assistant or associate professor and have attained significant research work during their early career. Many winners have already received National Science Foundation Career Awards recognizing their potential. The Reach for the Stars winners get a $10,000 annual research grant for three years, which can be renewed based on their promising work. This is the second year UCF has given Reach for the Stars Awards at Founders’ Day. 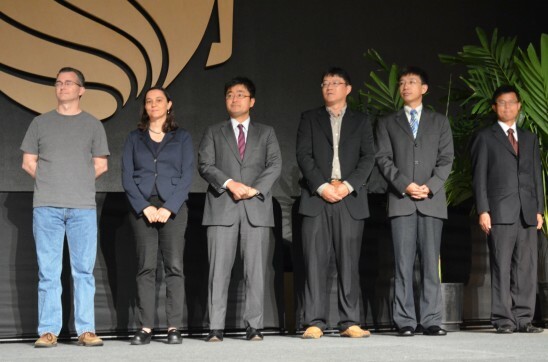 The 2015 winners are: Weiwei Deng, Haiyan Hu, Gita Sukthankar, Dingbao Wang and Jun Wang from the College of Engineering and Computer Science, Sasan Fathpour from the College of Optics and Photonics, Masahiro Ishigami from the College of Sciences and Ken Teter from the College of Medicine. Weiwei Deng is an assistant professor in the Department of Mechanical, Material and Aerospace Engineering. He leads the Deng Lab, which is exploring scalable and affordable nanomanufacturing of efficient solar cells and other flexible electronics devices. He joined UCF in 2010 and has a Ph.D. in mechanical engineering from Yale University. He has published more than 20 peer-reviewed research articles and is a member of the American Association of Aerosal Research and the Combustion Institute. Haiyan Hu is an associate professor in the Department of Electrical Engineering and Computer Science. Her research focuses on bioinformatics, computational biology, data mining, machine learning and pattern recognition. One of her areas of expertise is combining data mining and developing computer algorithms to help biologists solve human health problems. She has more than $1 million in grant funding from the National Science Foundation and was awarded an NSF Career Award in 2012. She has published dozens of research papers applying informatics to health care questions. Gita Sukthankar is an associate professor in the Department of Electrical Engineering and Computer Science. She leads the Intelligent Agents Lab, which focuses on artificial intelligence and machine learning, primarily in the context of multi-agent and multi-robot systems. Sukthankar has a Ph.D. from the Robotics Institute at Carnegie Mellon, and a bachelor’s degree in psychology from Princeton University. Between her masters and Ph.D. she worked as a researcher at Compaq Research/HP Labs in the handheld computing group. She joined UCF in 2007 and is a frequent presenter at conferences. She has published dozens of articles on cutting-edge topics such as crowdsourcing applications on mobile devices and conflict and communication in multiplayer online games. She has multiple grants and a NSF Career Award. Dingbao Wang is an assistant professor in the Department of Civil, Environmental and Construction Engineering and a water expert. He joined UCF in 2010 and has multiple degrees in civil engineering from the University of Illinois at Urbana-Champaign. He’s received many accolades for his work in the area of hydrology, human and water systems and climate change and the impact of sea level rise on coastal hydrology. Among the awards he has received are the Best Research-Oriented Paper Award from the Journal of Water Resources Planning and Management and a fellowship from the American Society of Civil Engineers. Jun Wang is an associate professor in the Department of Electrical Engineering and Computer Science. Before joining UCF in 2006 he was a faculty member at the University of Nebraska, Lincoln. His area of research includes Big Data and big computer systems as well as data-intensive, high-performance computing and massive storage and file systems. He was the recipient of an NSF Career Award and a U.S. Department of Energy Early Career Investigator Award. He has authored more than 80 articles in journals. Sasan Fathpour is an associate professor of optics. He joined the CREOL faculty in 2008. He has multiple degrees including a Ph.D. in electrical engineering from the University of Michigan, where he demonstrated the world’s first temperature invariant semiconductor laser and the fastest quantum dot laser to date. He worked at UCLA prior to coming to UCF and his work in California on energy harvesting in silicon photonics received worldwide media coverage. He received an NSF CAREER award in 2012 and an Office of Naval Research Young Investigator Award in 2013. He is the co-editor of a book entitled “Silicon Photonics for Telecommunications and Biomedicine.” He also has co-authored about 85 journal and conference papers and six book chapters. Masahiro Ishigami is an associate professor of physics and is based at the NanoScience Technology Center. His areas of expertise are electronic transport measurements on novel nanoscale materials, scanning tunneling microscopy and spectroscopy of nanoscale thermal/mechanical/electronic devices, and nanomaterials synthesis. His work in the area of carbon nanotubes has generated excitement in the nanotechnology world. Ishigami has a Ph.D. from the University of California at Berkeley and he has authored dozens of articles, which have been cited more than 4,300 times by other scientists. He has more than $1 million in research grants and is a frequently invited speaker at conferences around the world. He works with a dozen undergraduate and almost another dozen graduate students in his lab. Ken Teter is an associate professor in the Burnett School of Biomedical Sciences housed in the College of Medicine. Teter’s lab focuses on how infections impact human health. His specialty is examining the molecular details of how cholera toxin disrupts cellular functions. If scientists can discover how cholera toxin enters the body, they can devise ways to slam the door on those entryways. He has four federal grants including three from the National Institutes of Health and he is passionate about passing on his love for research to his students. He has many graduate students in his lab who have already published their work in journals.